After 11 weeks of composting we have just finished the tenth pile using the GROW BIOINTENSIVE method at the SFS Composting Plant. An average of three collections (one week) completes each pile, which consists of approximately 900 kilos (1,984 lbs.) of green organic materials. The piles are built in layers 1.5m x 1.5m (5ft x 5ft) to a height of 1.2-1.4m (4-4.5ft) and shrink to a height of about .5m (1’8”) after three weeks of decomposition, at which point the pile is turned. After 8 Piles we began a second row. During the initial three weeks of decomposition we monitor the piles temperature with a standard 50cm (20”) thermometer. Each pile has heated up to a temperature past 60ºC (140ºF) within the first week of their decomposition thanks to prolific and much welcomed thermophilic bacteria. Two piles heated up to 79ºC (174ºF) back in October during a dry spell with 37ºC (100ºF) days! And on cool evenings and mornings vapor can be seen rising off the compost, sometimes in large quantities, prompting Virgilio to think that someone had come and set fire to the first pile. Local volunteer, Pani, turning the compost. – Next we take out all of the framing sticks and recycled boards and then we use a large pitchfork to throw the material over the prepared area. The material is just thrown into a heap and then covered with topsoil. – All of the sticks at the bottom of the pile are then gathered for reuse in the following pile. The pile is then left to decompose further for another 2 months before it used as a soil amendment. Ecology Action suggests only turning the pile once to conserve plant nutrients as these precious resources are lost with each turning, thus to produce the highest quality product we have followed this advice. Although, our first pile was turned a second time, one month later, to speed up the process and meet our reforestation needs. 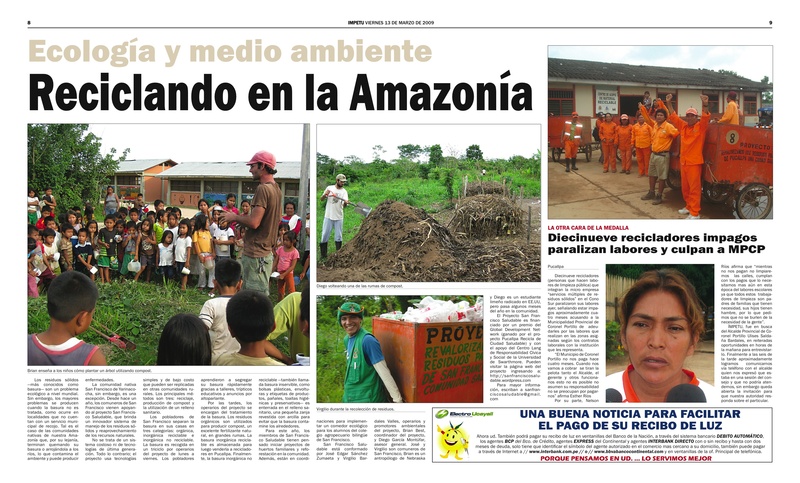 Virgilio and the team worked with the preschool to reforest an area behind the compost plant with compost from the 1st pile. Preliminary soil analysis show the first pile to have a pH of 9, which will help neutralize the acidic soils of the Amazon, and an electrical conductivity (EC) reading of 7.51 dS/m, demonstrating high levels of plant available nutrients. A complete analysis will be conducting in January once we have more compost piles near maturity. At the rate that we have been collecting organic materials from the community (about 1 metric ton a week) we will now have approximately 600 kilos (1,322lbs) of compost available each week for sale and agro-forestry investments to help sustain our work. A portion of the compost will also be donated to the community in our support of reforestation and sustainable agriculture efforts.